(more importantly) Support advertising rather than charging for downloads. Hulu has only professional content, and advertisers love it. … Hulu now offers content from more than 110 partners. Plus, people watching tend to sit still, whereas people listening tend to move. 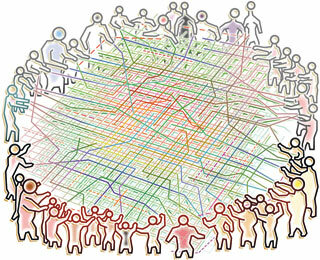 Last week, The Economist had an interesting piece (pdf) on the tragedy of the commons. In 1968 Garrett Hardin, a professor of biology, published an article in the journal Science that explained “The Tragedy of the Commons”. He suggested that, from the point of view of efficiency, the commons should be replaced by systems of public or personal ownership. However, when economists began to look at how systems of commonly managed resources actually worked, they found to their surprise that they often worked quite well. Though there were failures, too, it seemed as if good management could stave off the tragedy. Before he died, Hardin admitted he should have called his article “The Tragedy of the Unmanaged Commons”. In “Governing the Commons”, which was published in 1990, Elinor Ostrom of Indiana University described the rules needed to keep a commons going. She showed that there are almost always elaborate conventions over who can use resources and when. Yesterday I came across this terrific piece of research (pdf). “1) A mobile phone client lets both emerging musicians and audiophiles wirelessly upload their tracks at upload points inside the Underground station ticket halls. 2) This same phone application lets users download tracks from download points on the train platforms as well as from other users in proximity. For example, emerging musicians can get some free publicity by uploading their latest track and by adding the date of their next gig as a note to the track. Researchers at the Hebrew University in Jerusalem found a link between a gene called AVPR1a and ruthless behaviour in an economic exercise called the ‘Dictator Game’. You can download The Future of Ideas by Lawrence Lessig free here (local pdf) or buy a (real) paper copy of it here. Are you downloading copyrighted files? You are out! A proposal(*) backed by French president Nicolas Sarkozy: those people who download copyrighted material (using, for example, P2P networks) will get disconnected from the Internet by their ISPs. “Like it or not, the total cost of Internet service will rise because French ISPs have signed on to the plan. They will now spend time and (tax) money enforcing copyright on their networks via expensive deep packet inspection (DPI) software that will monitor traffic on their networks and look for copyrighted content. Subscribers detected illicitly sharing or downloading copyrighted material will receive warnings, requiring additional administrative overhead. If the behavior continues, then Internet access would be guillotined. Most of this will be carried out by a government-funded independent authority overseen by a judge” (full post). (*) I do not describe the proposal as being insane just for this reason: “Do not be hectoring or arrogant. Those who disagree with you are not necessarily stupid or insane. Nobody needs to be described as silly: let your analysis show that he is. When you express opinions, do not simply make assertions. The aim is not just to tell readers what you think, but to persuade them; if you use arguments, reasoning and evidence, you may succeed. Go easy on the oughts and shoulds. ” You may well understand to which category Mr. Sarkozy qualifies to belong. Can I rent your battering ram? A very neat slideshow about reputation, made by Rentathing, that I saw on .. I’m not sure if it is working here so click on the link to Paolo’s blog if it isn’t! I’m reading a very interesting book: Herds by Mark Earls. Here is a talk the author gave in London last week. The event also featured Howard Rheingold who authored Smart Mobs. Simply brilliant! Claudio (from IIIA and sponsored by MyStrands) gave a very interesting talk about poolcasting (pdf of his slides). Poolcasting is a web radio in which individuals may join different channels. Those subscribed to a channel will listen to the same stream of songs. The problem is how to select the songs on that stream. Claudio did so by combining the preferences of a channel´s listeners using Case-Based Reasoning. The same approach may be used for mobile music. A bar may decide to play songs depending on the preferences of its customers (and preferences may be elicited from the playlists that customers store on their mp3 players or mobile phones). A couple of questions that might be of interest to some of us: what if listeners do not share many songs in their playlists? Would it be possible to factor listeners´ reputation (trust) in deciding which songs to play? I was at Mobiquitous 2007 in Philadelphia last week. Content Source Selection in Bluetooth Networks (my paper). This is an interesting area of development and, I believe, important for the realisation of large scale market penetration of networked mobile devices. I’m sure most of you are aware of online digital media stores, such as the iTunes Store and Napster. Most of these stores employ Digital Rights Management (DRM) to limit the sharing and playback of the purchased tracks, though not all sites are so restrictive (Emusic). Apparently, Apple barely makes money from their store, and use it as a driver for their iPod device range. The iPhone automatically synchronises with your computer’s media collection whenever it is connected. Ensuring you are always walking around with your most up to date data. Other mobile device manufacturers are now trying to make use of these loyalty inducing services, Nokia making MOSH and possibly its own store. Sony Ericsson has the rather silly named m-buzz and its Playnow service. Even companies that don’t manufacture devices are focusing on the mobile music shop market, such as RoK. This combination of digital media stores and mobile devices shows an awareness by companies about people’s usage of digital media on the go, and its attraction. Not just to improve the user experience, but also to try and lock them in to their particular device/network provider. This is achieved not only through the inertia caused by familiarity of the particular shop, but also the format the music is supplied in. Including both the actual music encoding (WMV is Microsoft’s, RealAudio) or the DRM container (FairPlay/PlaysForSure/Helix DRM). Leading to consumers only being able to use some devices with their music collection, and equally only purchase material from shops that their device supports. The adoption of digital music sales as an added part of the mobile device ecosystem demonstrates people are willing to pay for digital media, especially on their mobile devices. Interestingly, the low margins on this service has caused it to often be a value added feature rather than a profitable venture in its own right. The renegotiation of terms by Universal may lower the distribution margins even more. The posibility of direct sales of music tracks by artists, without the labels acting as middlemen, may increase the profits for content produers and distributers, making it a viable option in future. The unpopularity of DRM, is causing new developments a such as watermarking and charging a premium for the lack of it, will hopefully stimulate the market further. Patrick Lord introduced his company’s main application – MobiLuck. It’s a short range wireless messaging application. MobiLuck allows you to detect all Bluetooth devices around you and to store a mini-profile in your Bluetooth name. The mini-profile can include for example your nickname, gender, age and phone number (dating profile) or your first name, last name, company and phone number (business profile). Your mini-profile is detected instantly by other MobiLuck users. You can then send a message (or your picture or your business card) with your mobile in a few clicks, for free, with no need of the recipient’s phone number. Lucia Garate (of Vodafone R&D, Madrid) presented Vodafone Betavine that aims to help developers create new and innovative services using mobile communications APIs. Ajit Jaokar (London) listed some of the concepts behind its latest book (Mobile 2.0). Similar events are offered in London.